This archive was acquired for use free of charge from the Genoa Chamber of Commerce in December 2004. 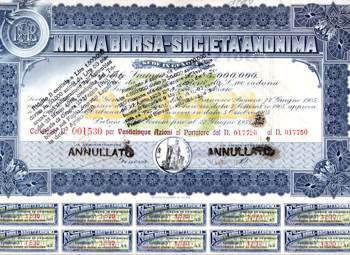 The archive documents the activities performed by the management committee of the stockbrokers and other parties operating in the Genoa stock exchange over a wide period of time (1856-1993). On 5 July 1840 the city of Genoa gave the chamber of commerce the restored Loggia dei Banchi for the stock exchange to be housed there; this date marked the birth of the Genoa stock exchange, which would actually be officially instituted at a later date, with royal decree 1020 of 18 August 1855. Following Italian Presidential Decree 31/3/1975 no. 138, the powers and attributions relating to the organisation and running of the Stock Exchange were taken from the chamber of commerce and local bodies and given to Consob, with the exception of certain subsequently delegated functions. Finally, with the law of 2 January 1991 no. 1 transferring the functions of the local stock exchange bodies to the stock exchange council, the Genoa Stock Exchange, for a long time the most important in Italy in terms of prestige and business, ceased to operate, with closure of the registers and archives on 11 November 1993. The archival series produced by the management committee number 26, composed of 947 items (envelopes and registers). Fourteen associated archives follow, composed of 432 items (envelopes and registers). The archive has a subject index, available both on paper and computer, created by Gino Bogliolo. The inventory is available in the viewing room of the Ansaldo Foundation.